GIJoe, like Wall Street shenanigans and a nearly criminal government, has re-emerged from the '80s with a new polished veneer. I find that I've been doing a lot of GIJoe reviews lately, but that's really just a function of a few factors: other companies seem to be in between lines at the moment, and I found a good sale. Plus, I really like the removable armor aspect of these new SpyTroops. Like all the new Joes, the SpyTroops come in two-packs: one Joe and one Cobra for prices similar to what they were in the '80s. Really, you can't beat that; the only drawback is that you're forced to buy figures you otherwise might not want. But when a brand new Dreadnok showed up in the SpyTroops line, I couldn't resist for long. I always found Zartan to be one of the best GIJoe figures in the original line, so the rest of the Dreadnoks were cool by association. They were soda-swilling, doughnut devouring louts, and while they were fairly ineffectual fighters (you never expected the 'noks to beat a group of Joes), they still had a certain charm all their own. One of the few Dreadnok members with a real practical skill, Burn Out could have been an engineer if he hadn't dropped out of a top technical school during freshman orientation. A natural genius at mechanics, he became fascinated with motorcycles at an early age. His superb handcrafted custom bikes soon caught the attention of Zartan, who lost no time in recruiting him for the Dreadnok group. 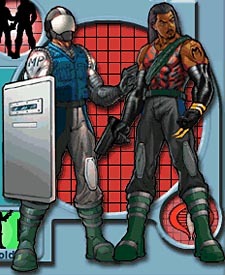 It was Zartan who encouraged Burn Out to expand his expertise to a broader range of mechanics and sparked his interest in disguises. Burn Out is a bit of an oddity - in all the illustrations, he looks like a black guy with dreads. The actual toy, however, looks more Hispanic than anything else. It's not a major complaint, but I think either the art or the figure should have been redone. In his Dreadnok gear, Burn Out wears a gray camo shirt encircled with barbed wire, black arm wraps, dark pants and big clunky boots. In his (laughable) disguise as an MP, he sports a large blue vest, an oversized helmet, and a bit of shoulder armor that conceals his Dreadnok insignia. Thinking about the SpyTroops idea, it seems to make more sense for the Joes to be in disguise - after all, it's Cobra who employs scores of indistinguishable cookie-cutter troops, not GIJoe - and Burn Out seems to bear that out. Cobra uniforms always seem to hide the face, while the good guys are more open with their identities; giving what is supposedly a GIJoe MP a ridiculous helmet just makes him stand out, not blend in. 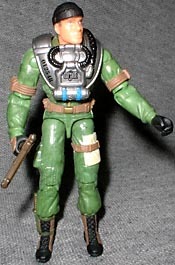 The second figure in this set is Chief Torpedo, an update of a Joe that first appeared in the second wave of figures back in 1983. You've gotta admire Hasbro for updating even the unknowns from the original line; most kids knew Deep Six or Wetsuit as the underwater guys, not Torpedo. U.S. Navy SeALs are the toughest of the tough, and Chief Torpedo may be tougher than all the rest. He goes out on a five-mile run and does a hundred push-ups before breakfast, and after that he starts the serious training. Dropped from a moving helicopter into deep water, he can swim to shore with a hundred pound pack full of weapons, run cross-country for ten miles, and still be back at headquarters in time for dinner at the mess. A Navy SeAL, Torpedo has finally gotten out of his wetsuit and into some normal clothes - he's wearing a green uniform and a stocking cap, and has a removable advanced SCUBA rebreather around his neck. Torpedo is also an example of why these two-packs were the distribution of choice for Hasbro: compared to some of the outlandish characters, he's deadly boring. No one would run down the toy aisle searching desperately for Chief Torpedo by himself, but packaged with something cooler? Well, his chances improve. Torpedo is a very plain figure, hardly one to stand out among all the other colorful Joes. Or maybe that's the idea: there are still people who are big fans of the ultra-generic laser-trooper "Flash" from the original line, so Torpy may get a cult following as well. Chief Torpedo and Burn Out both have the classic GI Joe articulation: neck, shoulders, biceps, elbows, waist, hips and knees. Burn Out has additional articulation at the boot tops. I can't really recommend this set, because it pairs a poorly designed villain (with a terrible disguise) and an unimpressive hero. Fortunately, this one bad set is not indicative of the line in general. Man, who thought this one up? Tell us on our message board, The Loafing Lounge.